To capture a compile log you’ll need to do a fresh compile and capture the output. You may want to just share the output from mapname.log but sometimes that log file may be missing information, or you may accidentally include old compiles. 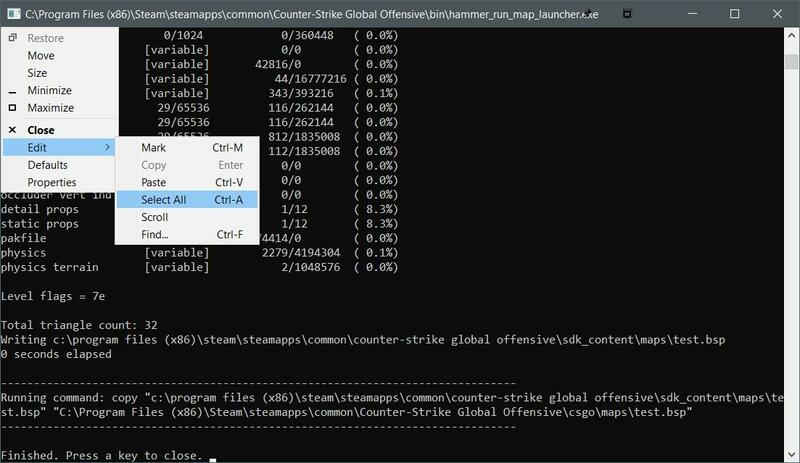 Let’s take a quick look at the 2 different compiler windows. On the left is the CMD style compile output. This is seen in newer games. If you have the old embedded compile output: Just click Copy to Clipboard. Paste the log to: https://pastebin.com/ and then give the log to whoever is helping you. 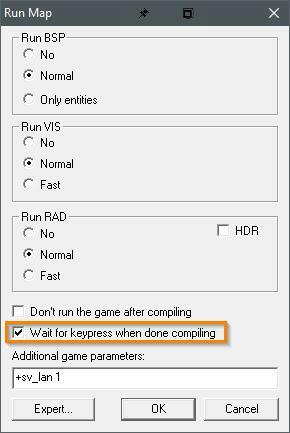 If you have the newer cmd compile output: Before you compile, there should be an option of Wait for keypress when done compiling – Enable this. This will keep the compile window open when the compile completes. After the box is checked, compile the level and wait for it to finish. Then click on the title bar icon in the top left, this will open the action menu. Select Edit -> Select All. 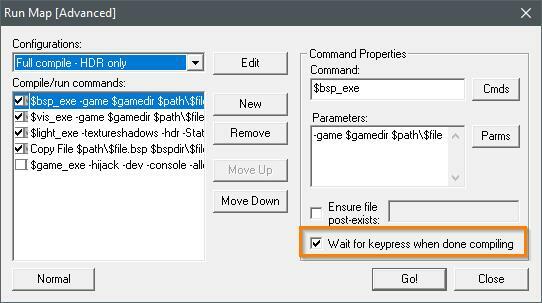 Using a hotkey may close the compile output before you can copy it, using mouse commands ensures that you don’t accidentally close the window. After selecting all, open the menu again and select Edit -> Copy. Paste the log to: https://pastebin.com/ and then give the log to whoever is helping you.